Vehicles must be in good mechanical condition and must have working brakes. Vehicles must have an easily accessible to hook. Only one driver per vehicle. After market header and exhaust are allowed. Must have a seatbelt or racing harness. Roll bars, fire extinguishers, neck braces or any other safety devices is strongly suggested. Advertising on vehicle is allowed, no obscene decals or writing. All participants must attend mandatory drivers meeting. Drivers must show drivers license at registration. Absolutely no alcohol or illegal drug use. Promoter reserves full rights to disqualify or refuse entry for any reason deemed necessary. Registration will close at 6:30 night of event. No class changes after 6:30pm ****Traffic leading into event will get backed up, please plan to arrive early enough to sign up by deadline. If any vehicle has been rolled over before, it must have a full roll cage due to structure being compromised. Anything with a removable top must have a roll bar. All windows, except front windshield must be removed. All vehicles must be cleaned out and all loose items properly secured. Batteries may be mounted in vehicle, they shall be securely strapped down. Autocross will be divided into these classes. Front wheel drive car, rear wheel car/compact truck/minivan, large truck/four wheel drive vehicle, open class(run what ya brung) and side by side class. Other classes may be available depending on entries. Stock frame on all vehicles. No nitrous oxide, superchargers or turbos allowed (Factory turbo and superchargers are allowed). 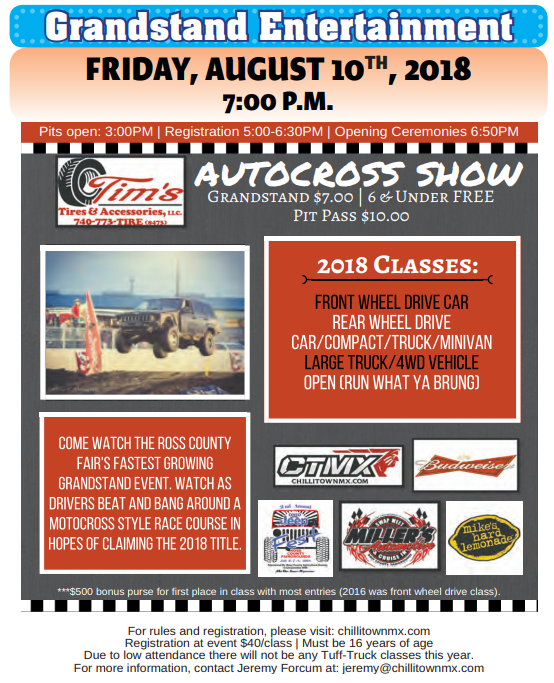 Guaranteed $500 First place award to autocross class with the most entries, other class to be on a 100 percent payback. *** IMPORTANT NOTE: ONCE WE BEGIN CALLING DRIVERS UP FOR A RACE, WE WILL START THE CLOCK FOR 5 MINUTES TO LOAD THE STAGING ORDER, IF YOU SHOW UP LATE, YOU WILL NOT GET YOUR STARTING POSITION. IF YOU ARE UNABLE TO MAKE IT TO THE START OF A RACE, PLEASE LET THE REGISTRATION KNOW IMMEDIATELY. © 2019 Chillitown MX. All Rights Reserved.